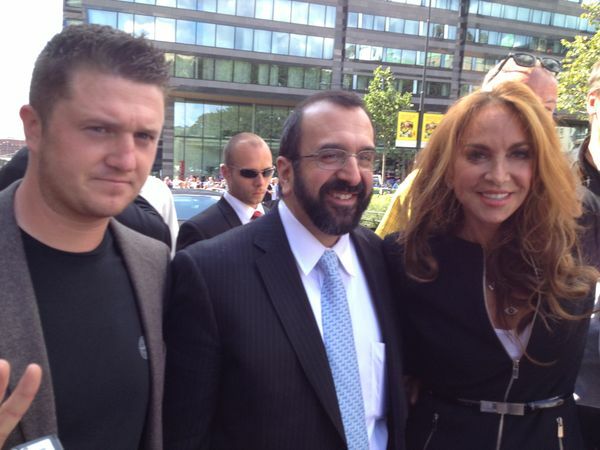 Pamela Geller and Robert Spencer have a record of performing U-turns over former English Defence League leader Stephen Lennon (“Tommy Robinson”), but this is getting ridiculous. “The poster boy for the stealth jihad”! Blimey. After that, I found it difficult to see how relations between Lennon and his two US sponsors could be re-established, at least in the short to medium term. How wrong I was. Geller and Spencer have just published a joint statement (see here and here) announcing that they’ve kissed and made up with “Tommy”. Not only has Lennon written to them “emphasizing that he has not changed his positions”, but Geller and Spencer feel that his performance in the BBC TV documentary When Tommy Met Mo provided proof of that assurance. There, and in a series of media interviews, Lennon has “acquitted himself admirably, demonstrating his commitment to resisting Sharia oppression and Islamic supremacism is as strong as ever”. So it would appear that what I took to be Lennon’s original plan is back on track. He will set up a new “counterjihad” group, perhaps a UK branch of Geller and Spencer’s Stop Islamization of Nations. No longer compromised by formal links to the street thugs and neo-Nazis of the EDL, Lennon may be able to pull in some significant financial backing for his new venture. So here is Lennon publicly linking up with two individuals who were only recently banned from entering the UK because their record of inciting hatred against Muslims made them a threat to public order. This is good news for Lennon, who can now hope to access funding from “counterjihad” sources in the US. But it leaves Maajid Nawaz, and all those who gave credence to Quilliam’s spurious claim that they had facilitated Lennon’s break with extremism, looking very stupid. This entry was posted in Analysis & comment, English Defence League, Far right racists, Right wing, UK, USA by Bob Pitt. Bookmark the permalink.